↑ 6,0 6,1 6,2 German National Library, Berlin State Library, Bavarian State Library et al. Record #118967622 // Gemeinsame Normdatei — 2012—2016. 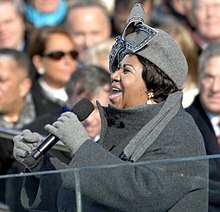 ↑ 7,0 7,1 7,2 7,3 7,4 7,5 Aretha Franklin, music’s ‘Queen of Soul,’ dies at 76 — Washington Post, 2018.